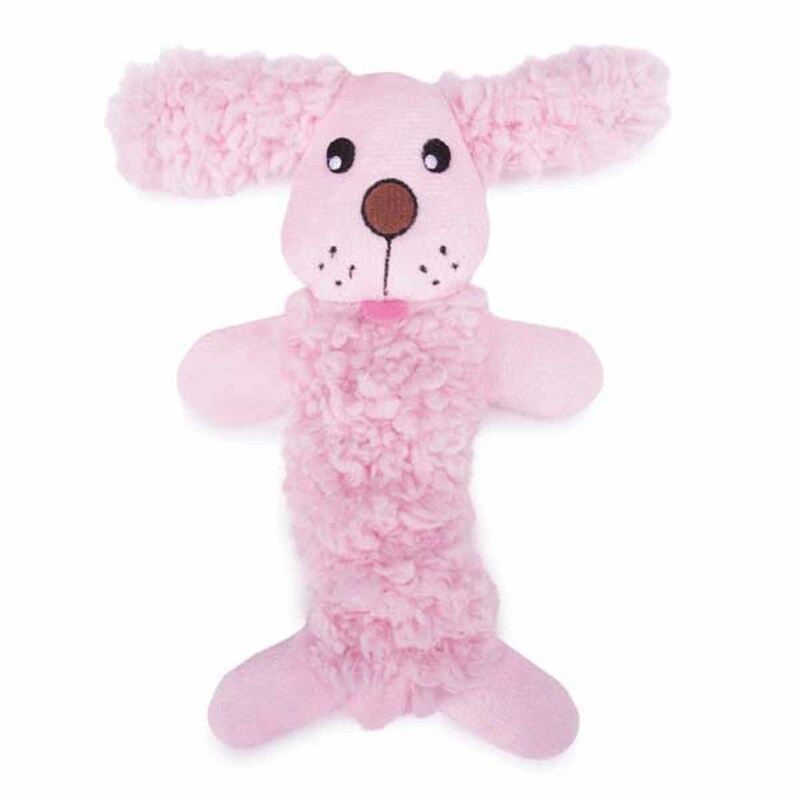 Grriggles Baby Bark Bungee Puppy Toy in pink includes flat and fluffy textures in the softest fleece to keep your new pup happy. Grriggles Baby Bark Bungee Pup Toys are little toys for little dogs and the perfect gift for "pet parents" welcoming a puppy into their homes. Bungee feature lets toy s-t-r-e-t-c-h, to teach puppies tugging games. Made of 100% polyester plush, bungee elastic, squeaker. Great gift for the newest addition to your family. Posted On 10/07/17 by Jennifer M from Rogers, AR Yes, Jennifer M recommends this product! Great size toy for my 10 pounder! She loves the bungee to play tug! MOM! What is this thing?! Teddi Bear, my 8-month-old female Morkie, has no love for this bungee puppy. It doesn't stretch far at all, has no squeaker...just not appealing. Posted On 01/15/17 by Billie H from , PA Yes, Billie H recommends this product! This toy is perfect for my 8 week old German Shepherd/Labrador Retriever mix. She absolutely loves it, and sleeps with it every night! Posted On 01/07/17 by Joan K from Lakewood, OH Yes, Joan K recommends this product! Really cute toy for a small new puppy. Posted On 06/24/16 by Lisa J from Northfield, OH Yes, Lisa J recommends this product! My little chi loves this toy. It is lightweight and small. I even ordered a spare! It is smaller than I thought which is what I hoped for. Perfect for tiny dogs. Its 8" not stretched but narrow and light. No squeeker so nice for before bed play. Very very soft and nice quality. Posted On 05/08/16 by Sandee L from Bullhead City, AZ Yes, Sandee L recommends this product! My dog carries this toy around like it is her baby. Cute. Got this for my mom's new puppy. She's only 2.5 pounds. This is small and light. It's great for baby pups. My New Puppy Loves this Toy! Posted On 12/15/15 by Kim D from Beverly Hills, CA Yes, Kim D recommends this product! I've got a very small puppy and she's loving this toy--she carries it around like a prize!